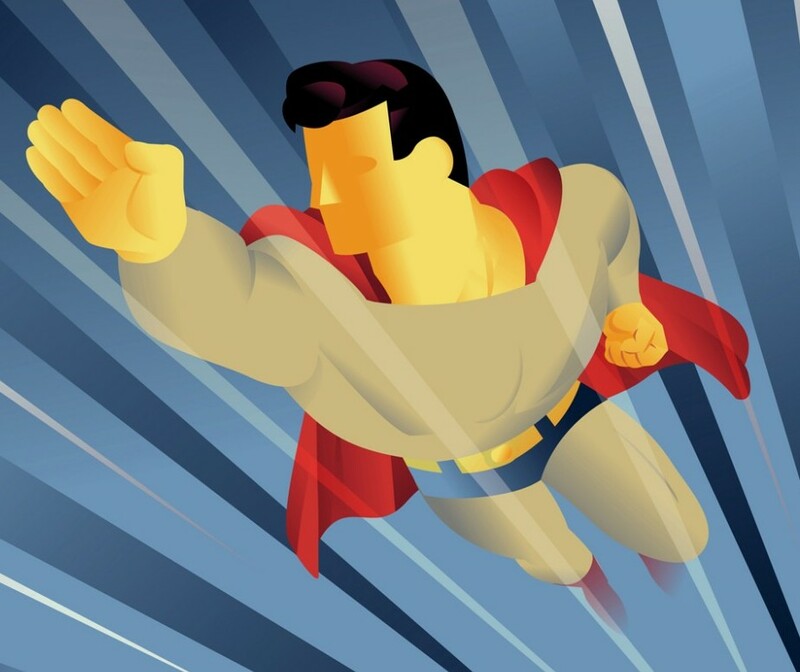 Uncanny X-Men – Teach Like a Superhero! A new generation of students has taken up the cause of Professor X, as featured in the series Wolverine and the X-Men. Unfortunately, headmaster Wolverine has recently died in the Marvel Comics world, leaving a void in the faculty at the Jean Grey School for Higher Learning. 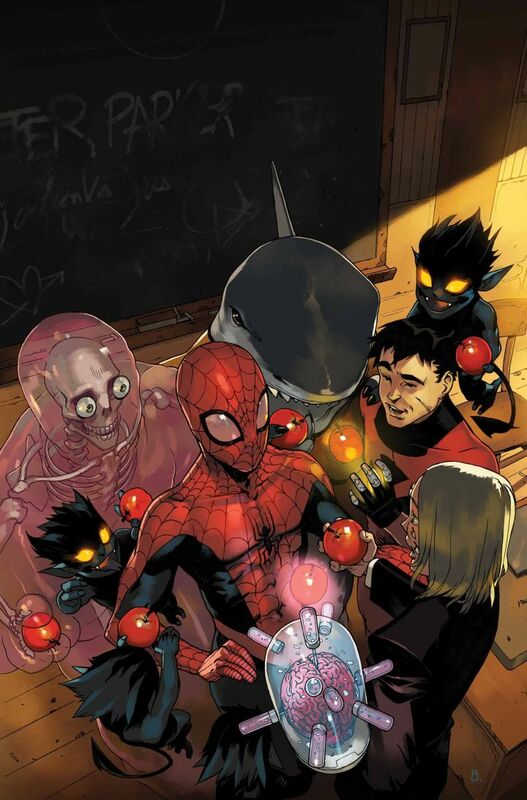 I bet Wolverine’s health will improve soon, but in the meantime another hero has joined the staff of mutant educators: your friendly neighborhood Spider-Man. 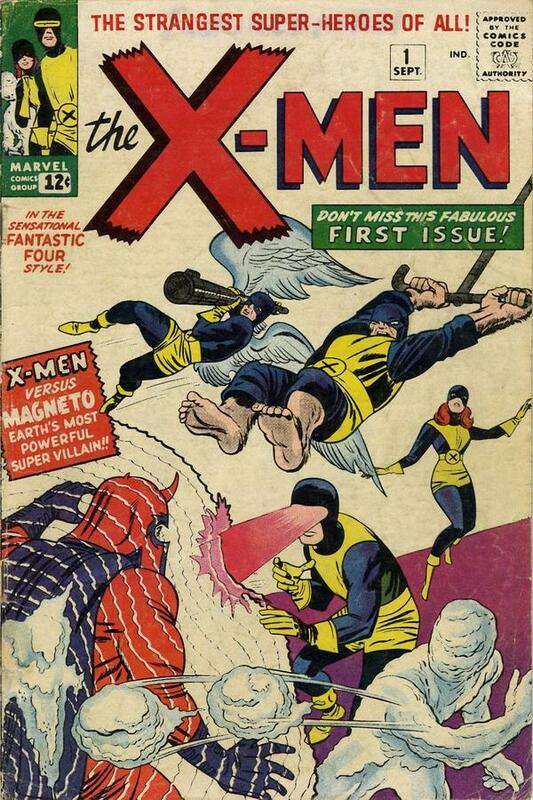 One potential problem, though: Spider-Man is NOT a mutant. In other words, he was not born with his extra-human abilities. 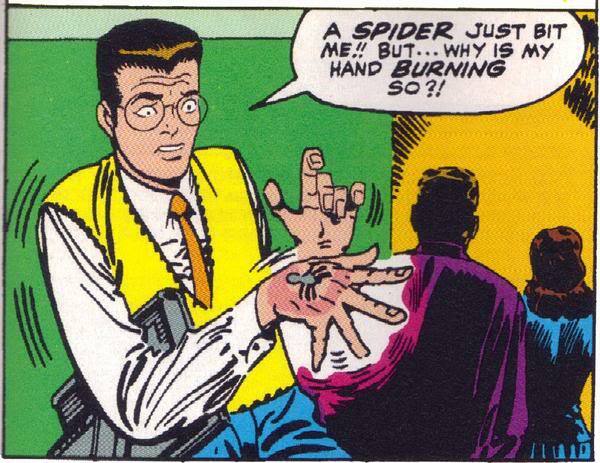 Peter Parker needed a radioactive spider bite to get his superpowers. Remember this iconic scene? Differences in genetic background and superhero lifestyle could become a source of conflict not only between Mr. Spider-Man and his students, but also with the mutant teachers and staff at the school. Such educational discrepancies do not occur in comic books only. They can also arise in real life. Research studies have found a “racial/ethnic gap between students of color and their teachers,” something that has increased over the years (Villegas, Strom, & Lucas, 2012). With a growing population of minority students, teachers from similar racial/ethnic backgrounds are in high demand (Bireda & Chait, 2011). Why is it important to match teacher and student demographics? One may assume that students react more positively to teachers who share common characteristics. Likewise, minority teachers can serve as positive role models to minority students. However, clear empirical evidence of these assumptions is hard to find, understandable given the complexities of schooling and learning. Some research studies have found learning gains when teachers and students share similar ethnicity (Dee, 2004; Klein, Le, & Hamilton, 2001). Nevertheless, these reports note an underlying factor that could have the greatest impact on student success: the actual quality of the teacher. 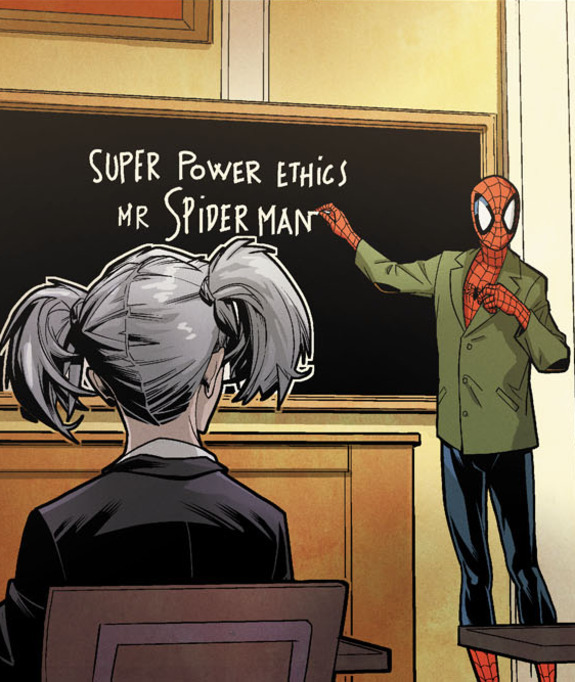 Spider-Man does have previous teaching experience. While plainclothes Peter Parker during the day, he did a stint as science teacher for his alma mater, Midtown High School, in Queens, New York. Home of the Fightin’ Living Brains! Mr. Parker’s public school teaching experience reflects real world trends. Typically, teachers like to teach close to where they grew up as students (Reininger, 2011). Or if not the same or nearby location, teachers may teach in a similar type of district or community. That was me. I grew up in a small Nebraska town of ~4,000 people. I graduated from a public high school with a class of ~70 students. My first teaching job was in a small Nebraska town of ~4,000 people (about 130 miles from my hometown). Each graduating class at this public school had ~70 students. What about you? Where did you go to school? Where do you teach? But one of the biggest challenges about teaching is that it requires extraordinary effort to assimilate the context and culture of the school when you first start. Even teachers who teach in their hometown must navigate through this transitional period. Moreover, imagine the degree of difficulty for teachers new to a community, culture, and/or country. It makes sense that teacher recruitment initiatives focus on fostering “pipelines” to increase quality teachers from high-need urban and rural settings (CTEP, 2014; Darling-Hammond, 2011). As much as I’d like, I can’t turn myself into a mutant, or even a super-powered human. (I’ve been bitten by spiders before. No wall-crawling abilities yet.) Still, I can be the best teacher I can be, no matter where or whom I teach. Regardless of our ethnic, cultural, genetic, or other demographic descriptors, we can all work to cultivate meaningful relationships, creating memorable learning experiences for our students. Part of this work includes finding ways to connect with the kids and their community. Don’t try to fake it, however. Students have a special (mutant?) ability to see through disingenuous teachers, even those with good intentions. Admit your differences, if need be, and authentically work to find common ground. A universal purpose in all schools is to expand understanding and appreciate learning. 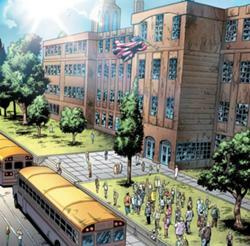 Who knows how long Spider-Man will stay on staff at the Jean Grey School for Higher Learning? You can read more about the creators’ plans for Spider-Man and the X-Men here, here, and here, if you’re interested. I hope Mr. Spider-Man makes a positive difference during his tenure, long or short. 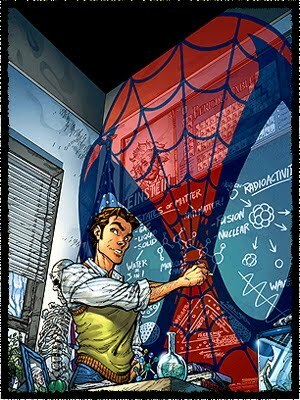 And like the best teachers, Spider-Man should learn from his students as much as they learn from him.